ARTexplains began when Xander was joking with friends about starting a YouTube channel called 'Eleven Ways How Not To Handle', in which awkward situations are dealt with in suboptimal ways -- such as being pulled over by a cop and trying to bribe them with various things in your car. He began collecting ideas in a notebook with the help of his friends Donovan Campbell and Stevie Slivicki. Unfortunately, Don passed away in 2013, and that channel was never made. Xander wanted to make something anyhow, but wasn't sure what to make on his own. Reflecting upon the YouTube channel Scishow, which Don had introduced him to, he set about making an 'explaining'-type channel but with a zany twist. 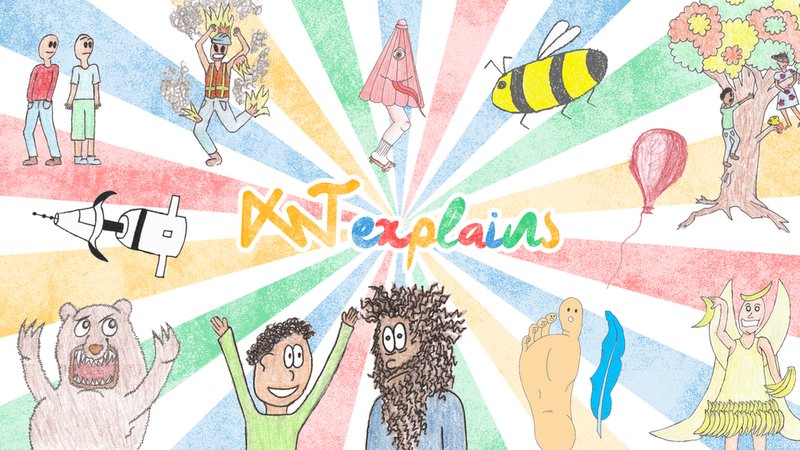 Xander registered a YouTube channel called ARTexplains -- the ART standing for his initials, Alexander R. Toftness -- wrote the first script ("Bees") and drew two bees with colored pencils on notecards to be the stars of the show. Then, he realized he didn't know anything about filming or editing video, got frustrated, and got distracted by school and work. The bees sat untouched in a Settlers of Catan game box for almost a full year. But then, Xander got frustrated with being frustrated, and one week in the summer of 2014 he set a goal for himself to finish and upload the first episode by Friday at midnight. In an attempt to be very forgiving with his own lack of editing skills, he declared that the first ten episodes would be “Bee-ta” test trials and he would crank them out just to get the project started, regardless of how bad the art and editing was -- This is also why so many episode topics start with the letter B. He held a B-rainstorming session for these Bee-ta episodes because he has this problem where he thinks he’s funny. Then, miracles of miracles, he started to improve, and really REALLY enjoy himself. He found out that his niche was the really weird stories that other people found too strange to touch, and fell in love with the history of medicine and psychology, as well as brief stints into physics and poetry. Xander became friends with many other YouTube channels that make educational content, and joined the group known as WeCreateEDU full of talented creators. Xander has collaborated with some top names in science along the way, and has begun a PhD in cognitive psychology where he studies how people learn from videos. Along the way, he discovered his passion and penchant for science communication, making his dream of writing non-fiction... non-fiction. If you are so inclined (or just really hate a particular dollar(s) currently hanging out in your bank account) you can support me through paypal at: PayPal.Me/ARToftness or through my Patreon page. Xander can be reached at alexander.toftness@gmail.com for business inquiries (or biz inks, as they are called by no one).